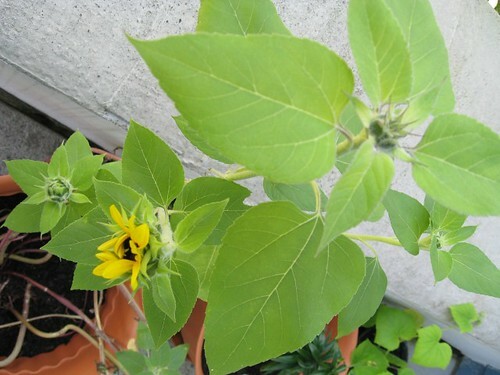 For the last two years the boys (NHL and JL) have tried to grow sunflowers. Each year something has happened to squash my little guy’s dreams of planting a seed to watch it bloom into a flower. First it was bunnies that ate them as they came out of the ground. Last year horrible hail storms crushed the poor plants. 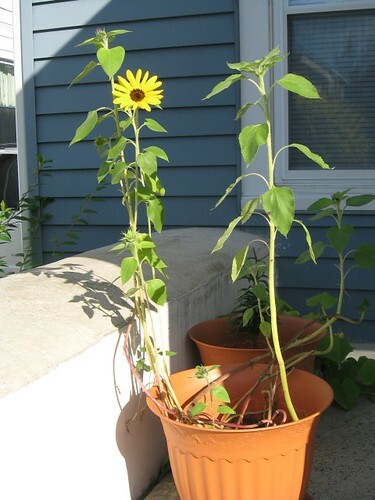 This year when we knew a storm was coming we pulled the sunflowers into our porch out of danger. Eventually they grew big enough that we thought they would be safe in the elements. 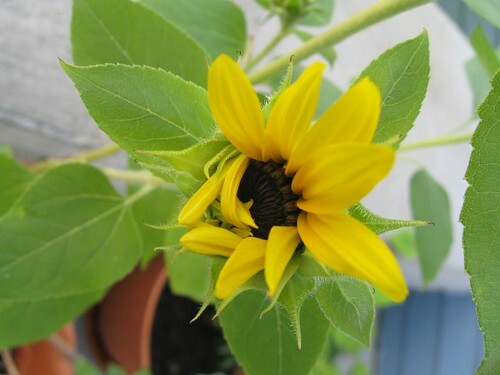 Just before NHL’s birthday our first sunflower finally started to come out. 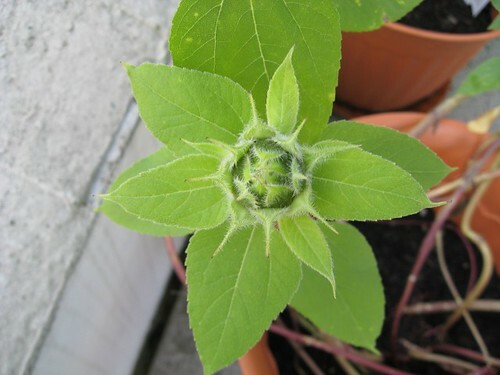 We were all quite excited and had to take photos of the baby sunflower. If you looked down at the plants growing you could even see many others that were getting close to blooming, like this one. 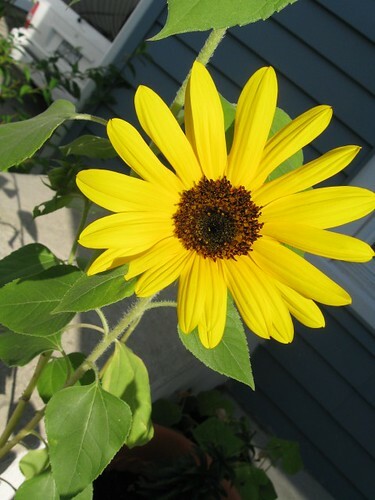 Growing up I was always fascinated with sunflowers. My best friend/neighbor growing up had monster sunflower plants in her yard. I remember her father planting them, caring for them and securing them because of their size. I think this is partially why I always wanted NHL to grow some for us. Although these are nothing like the ones Mr. D had grown, they still remind me of sweet summers of my child years. This is a close up of the flower that is now fully out from the other day. Saturday we noticed that two or three more were almost opening up. You could already see the yellow starting to play peek-a-boo with us. The picture below is now quite dated. I hope to get a few photos of the new flowers soon before the rain threatens them. With any luck the birds that are attacking our roses and already claimed our gorgeous new lily plant will stay away from the sunflowers that are doing so nicely. Perhaps we need to make a scarecrow for a project this week! Oh, how beautiful. Thanks for sharing them with us. I can’t wait to see more photos of them as they continue to bloom. The sunflowers look great! I’ve always thought about planting them too. Glad I didn’t given the hail this year. But yours have grown wonderfully well. I hope they bring smiles to everyone’s face. How exciting! 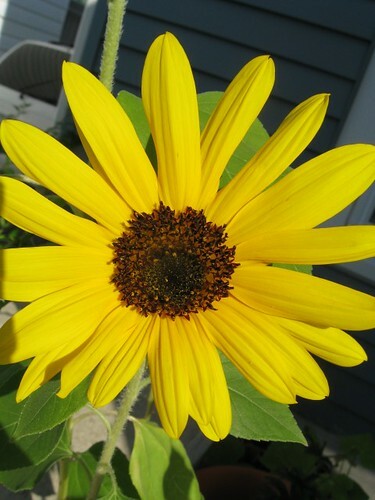 I recently learned that sunflowers always face the sun. Is that really true? If you make a spray of water with chili powder or black pepper, you may be able to keep the wild life off your plants.